Braxton Miller will make a decision on whether to return to Ohio State after the Buckeyes' Jan. 3 appearance in the Orange Bowl. 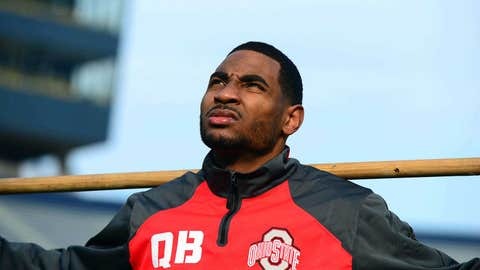 COLUMBUS, Ohio — Part of what Ohio State quarterback Braxton Miller said to reporters after practice Wednesday would indicate that Miller is leaning towards leaving for the NFL after the Jan. 3 Orange Bowl. Another part of what Miller said would indicate Miller thinks he’ll be back for his senior season in Columbus. So, his decision remains both unknown and on hold. Miller said on Wednesday that he’s not going to make any decision until after the Orange Bowl but also said that he thinks he’s ready for the NFL. "Yeah, of course," he said. That goes against what Ohio State coach Urban Meyer said last month when he said he believes Miller has the tools to succeed in the NFL, but isn’t ready yet. On Wednesday, Meyer said he won’t sit down with Miller or other potential Ohio State early entries until after the bowl game. I’m just focused on the team right now… and finishing strong for Buckeye Nation. Those 10 days betwen Ohio State’s return from the Orange Bowl and the NFL’s underclass entry deadline should be interesting. "I’m just focused on the team right now," Miller said. "I’m just focused on what we can (still) accomplish and finishing strong for Buckeye Nation." Through various questions on Wednesday, Miller said that a shot at the Heisman Trophy in 2014, family concerns (he has a young son) or the number of hits he’s taken this season would not factor into his decision. He’s basically admitted to thinking about the NFL without saying to what extent or if he’s leaning in one direction. Miller, who has won Big Ten Player of the Year honors in each of the last two seasons, has submitted paperwork to the NFL’s underclass advisory committee and sounded as if that will play into his decision. "It’s very important to that feedback from guys in the NFL — what round you (might) go in, what you need to work on fundamental-wise," Miller said. Asked what he can still accomplish at Ohio State, Miller said "learning from Coach Meyer, working on my craft and graduate, too." An elite athlete who’s made tremendous strides under Meyer and offensive coordinator/quarterbacks coach Tom Herman over the last two seasons, Miller’s completion percentage rose from 58 percent in 2012 to 63 percent this season, when he threw for 22 touchdowns vs. five interceptions. In Ohio State’s last two games, including the first loss of the Meyer Era in the Big Ten Championship Game on Dec. 7, Miller has completed just 14-of-36 passes for 234 yards. Miller’s decision could be affected by what those around him do, too — both at Ohio State and in the quarterback class. Four of Ohio State’s offensive linemen are seniors; Ohio State loses Corey Brown and Chris Fields from the receiving corps but assuming junior Devin Smith returns, the Buckeyes should have a more explosive group of receivers next season. Around the country, Oregon quarterback Marcus Mariota has announced he’s planning to return to school, Texas A&M’s Johnny Manziel is expected to go to the NFL and other potential prospects like UCLA’s Brett Hundley and Central Florida’s Blake Bortles have not announced a decision. The NFL’s early entry deadline is Jan. 14.